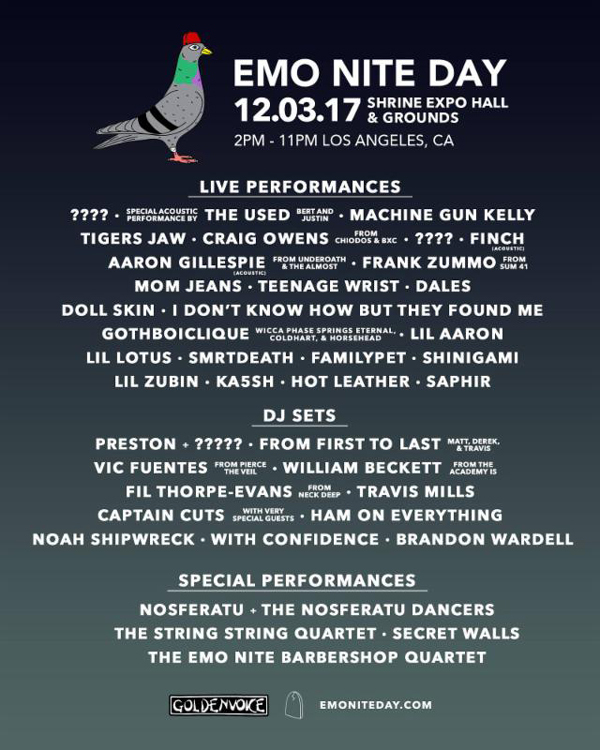 In celebration of their 3-Year Anniversary, with partnership from Goldenvoice, Emo Nite LA has announced their most diverse and massive lineup to date for the upcoming Emo Nite Day. Featuring Live Performances from The Used, Machine Gun Kelly, Tigers Jaw, Craig Owens (Chiodos), Finch, Aaron Gillespie (Underoath + The Almost), Frank Zummo (Sum 41), Mom Jeans, Teenage Wrist, DALES, Doll Skin, I Don't Know How But They Found Me, Gothboiclique, Lil Aaron, Lil Lotus, Smrtdeath, Familypet, Shinigami, Lil Zubin, KA5SH, Hot Leather and Saphir, DJ sets from Preston, From First To Last, Vic Fuentes (Pierce the Veil), William Beckett (The Academy Is), Fil Thorpe-Evans (Neck Deep), Travis Mills, Captain Cuts + Special Guests, Ham On Everything, Noah Shipwreck, With Confidence and Brandon Wardell and other special surprise appearances, this is truly going to be a day unlike any other. Taking over Shrine Expo Hall & Grounds in Los Angeles, California on December 3, this All-Ages event will bring together every element that Emo Nite fans love including the above performances across multiple stages, art installations, food trucks and more. Tickets are on sale now at emoniteday.com/. The Emo Nite LA founders recently premiered the short documentary "Every Nite is Emo Nite" exclusively with Paper Magazine. The film was directed by Anderson Wright and features three individuals that are central figures in their city's frequent events -- Rocky, Dante and Brittany. Although these three live in different states, have extremely different backgrounds and current careers, they all have found a home in their respective Emo Nites that have become a mainstay in cities like Portland, Baltimore, San Francisco, Seattle, Phoenix and of course, Los Angeles. Brittany spoke to why Emo Nite was important to her, sharing, "The music comes on, and everyone is equal." The documentary and exclusive interview with the Director are available here. Emo Nite LA is an event started by three friends (Babs Szabo, T.J. Petracca and Morgan Freed) that brings together people who share the love of emo rock music from the 90's, 2000's, and today. Different notable artists and musicians from all genres that have been inspired by emo and pop punk music have either DJ'd or performed at the events. 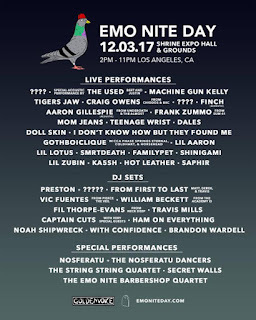 Emo Nite has been featured in outlets like MTV, Teen Vogue, Consequence of Sound, Forbes, Rolling Stone, The New Yorker, LA Times, Billboard, LA Weekly, Time Out LA, Alternative Press, FUSE, HelloGiggles KERRANG! and talked about on the Grammy's Red Carpet. These events continue to be a home for fans, musicians, actors and everyone in between. The environment created by Babs, T.J. and Morgan provides a space for anyone that has been impacted and influenced by Emo music to come together and celebrate that commonality.